Great critters Gun. Congrats! I was hoping you would post pics of your moose. I didn't know you also got a good whitetail. Awesome! Very nice ! Did you do it yourself? Hope you will take it to the ABA banquet. Thanks guys. Like I always say. Right place at the right time. Brad- yep the "A" mag. I added that to the post-oops. I do my own Deer and Bears that I'm not getting mounted. There were a lot of good Moose killed this year with a bow. Can't wait to see it in person. I haven't seen many big moose pictures this year. You should do well.... If they ask me to bring it I will. 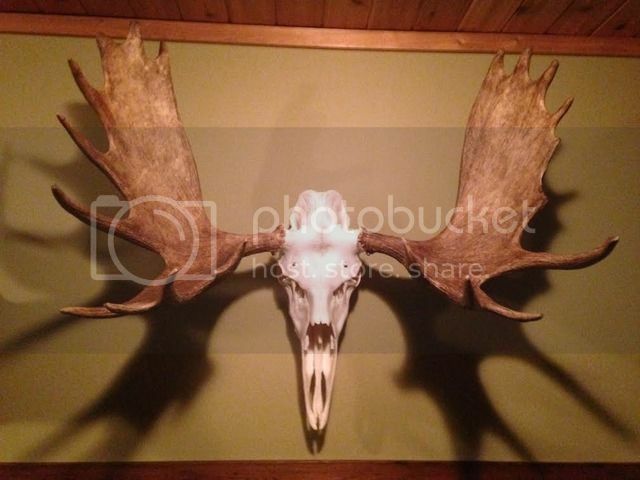 They might have enought elks mounts. Lots are showing on ABA. I also have mine cleaned up. I payed and got it done buy a guy that uses beetles. Nobody asks Yves. Just bring it. Last year there was hardly anything. Its always about the critters taken in the season that just ended. Some years there is a theme, highlighting a specific species. This years its Bears. I'm debating about bringing one. Depends on the weather. Like anything if more people contribute, the display will look good. I'll probably help set up again. You are correct last year was somewhat des appointing in the amount of displays. I will bring mine. See you there!